In 17th-century France, the Royal Navy was suffering a lack of sea-worthy vessels. One of Louis XIV’s ministers, Colbert, decided that the country should create a powerful fleet to combat attacks by the English and Dutch and built a dockyard on the Atlantic coast. He selected Rochefort as the site of a truly cutting-edge industrial complex whose activities focused on the navy. The site and nearby estuary became essential and were defended by a series of forts that created a “ring of fire”. They include stone treasures built in the middle of the sea or along the coast which have withstood winds and tides, wars and wear. They offer experiences that are both out of this world and authentic. 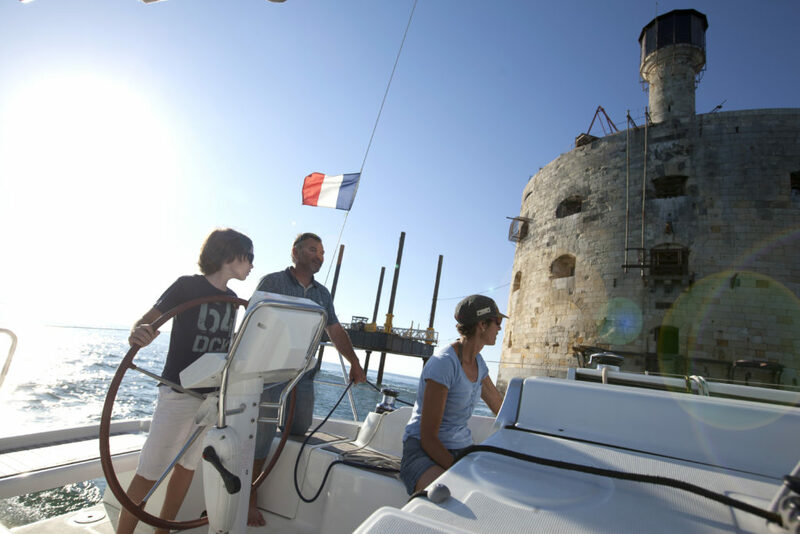 An imposing stone vessel, Fort Boyard rises up from the heart of the Pertuis straits, halfway between the islands of Aix and Oléron. It’s one of the coast’s most famous monuments thanks to the success of a gameshow that was popular for over 25 years in more than 30 countries. This TV hit was an unexpected tribute to a military building with a fascinating history. Begun under Bonaparte in 1803, construction work continued until 1866 under Napoleon III and represented a remarkable technical and financial achievement. It was a difficult endeavour: thanks to storms, which ruined incomplete walls, the capsizing of ships transporting the stone, and attacks by the English, progress was slow, and the work was not completed until 1859. Napoleon would not see it finished, leaving the Île d’Aix for a life of exile. However, progress in artillery was quicker than in construction work, rendering it useless as soon as it had been completed. It had cost the equivalent of more than €200 million in today’s money. It was the pride of the era, and a model of it was even presented at the International Exposition of 1867. Fort Boyard was used as a prison before being decommissioned in 1913. Abandoned by the army, it was put on sale in 1961 for 7,500 francs. Just two bids were made. The new owner seemed to lack both the resources and time to maintain their new property. The location was used in films on several occasions, but in the end it was television that saved Fort Boyard. Property of the Department of Charente-Maritime since 1989, it’s had a national and international media career since the first broadcast of the Fort Boyard TV show in 1990. Have you always wanted to visit Fort Boyard? Make your dreams come true and take a trip to this icon of the Atlantic coast. Cruises from La Rochelle, Rochefort, St Martin-de-Ré, Boyardville, Fouras-les-Bains or Port-des-Barques bring you up close and personal with this ocean behemoth, which is 68m long, 31m wide and 20m high! NB: Fort Boyard is not accessible to the public and no tours are available. To dive in deeper, try the Fort Boyard virtual tour. Fort Enet is located off Pointe de la Fumée on the Fouras peninsula. It was built on the orders of Napoleon to protect the Charente estuary because nearby cannons’ range was not enough to cover the area. The decision was made to build the fort in 1809 following the Battle of the Basque Roads (also known as the Battle of Aix Roads), during which the English navy caused significant losses to the French fleet. It took two years to build the fort. 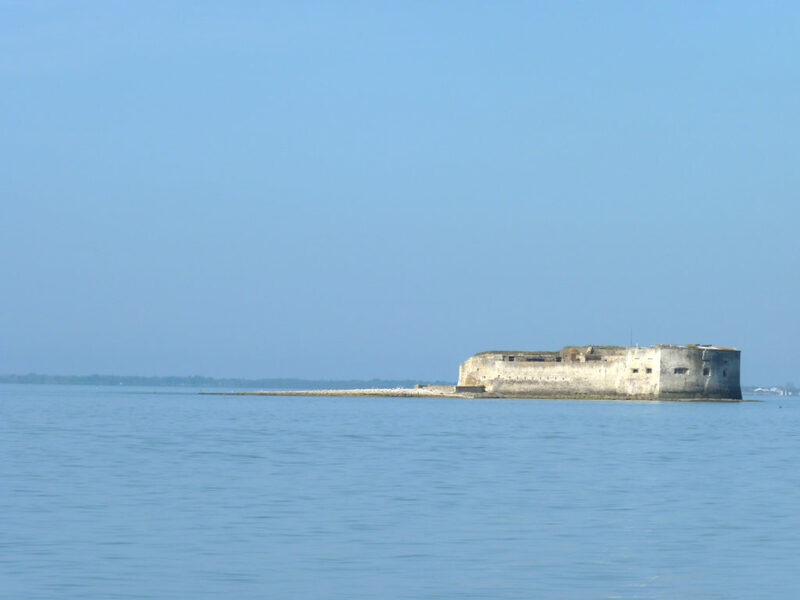 Visible from the Île d’Oléron bridge, Fort Louvois is instantly recognisable thanks to its horseshoe shape. In 1690, the Marquis of Louvois ordered the construction of a Fort in Chapus so that the cannons’ ranges would overlap with the guns at the Oléron fortress, cutting off access to the Rochefort military dockyard from the south. Construction followed Vauban’s plans and was led by engineer François Ferry between 1691 and 1694. It was the last marine fortification work ordered by Louis XIV. Fort Louvois is connected to dry land by a straight 400m paved path that is submerged at high tide. At low tide, it can be accessed on foot during a window that typically lasts three hours. However, it can vary between two and four hours according to the winds and the tides. At high tide, the fort can only be accessed by boat. Fort Louvois opens up its doors for a unique, surprising experience! In the keep, explore an ammunition and gunpowder magazine, as well as the officers’ and commander’s apartments. A thematic timeline exhibition tells the fort’s story, from its construction in 1691 to its restoration in the 1960s. A relief map illustrates the different forts that protected the Rochefort armoured dockyard. Climb to the top of the tower for a panoramic view and an orientation table. The enclosure holds the main gunpowder magazine and the “barracks”, the living quarters of the garrison. In the gunpowder magazine, you’ll find the mould for the King’s coat of arms. The tour is rounded off by a model of the fortifications along the coast and temporary exhibitions in the barracks. Guided night-time tours are available in July and August. You can complete your tour of the coastal fortresses by exploring some of the many forts built along the Atlantic coast between the islands of Ré and Oléron and along the Charente estuary. They include Fort Vauban in Fouras-les-Bains, Fort Lupin in Saint-Nazaire-sur-Charente, Fort Liedot on Île d’Aix and Fort Madame on the island of the same name. You can also discover the Charente-Maritime forts from the sky! 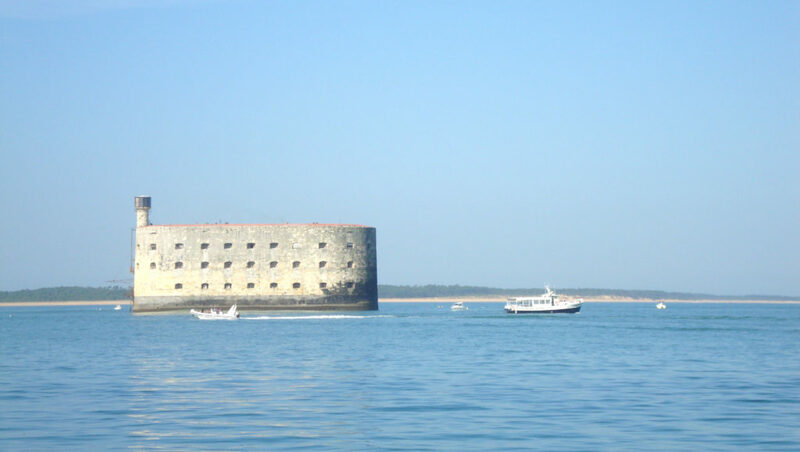 Many providers offer guided plane or helicopter flights over the forts at Fouras and Ile d’Aix, and Fort Boyard, with views stretching all the way to the Brouage fortress.